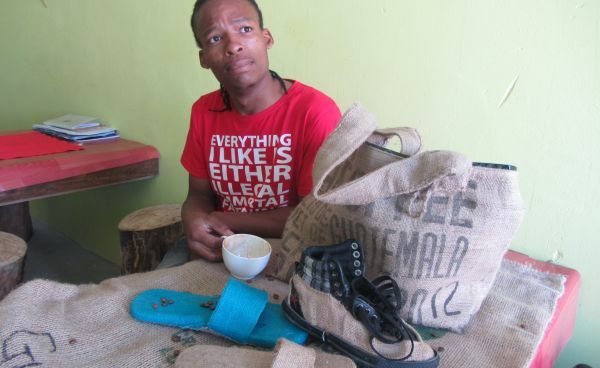 Meet Clement – a man with a love of coffee, a passion and a dream. Clement always dreamed of opening his own business but fear of what, how, funding and where were always a challenge. 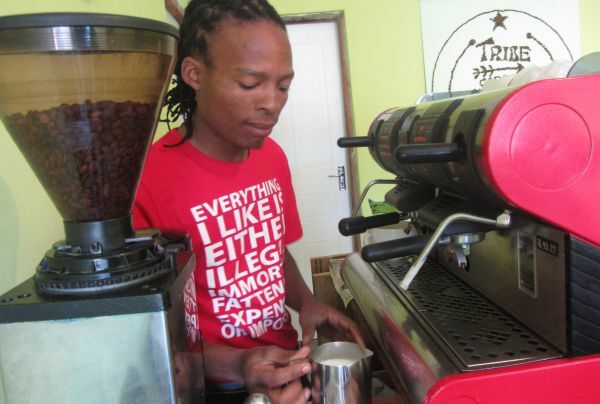 He is now the proud owner of Masi Cafe – a coffee shop in Masiphumelele on the Cape Point Route! Clement hails from Durban but found his passion whilst in Cape Town – this talented and personable man started out his career in the kitchens where he worked as a kitchen supervisor at Woolworths Cafe. He was drawn to the coffee shop and actually “demoted” himself to work as a Barista – such was the gravitational pull of coffee. Clement also worked as a cocktail barman – where, like coffee, he loved the creative and artistic aspect of creating a cocktail. Beverage based innovations were without doubt in his blood and his heart. At Cape to Cuba he created his own cocktail – a chocolate, cinnamon surprise. It was as a cocktail barman that he also learnt the disciplines that would be required for running his own business. A good and regular stock take, building relationships and reducing wastage where-ever possible. It was however coffee that fascinated and enthralled Clement and he got a break when he met Jake from Tribe Coffee in Woodstock! 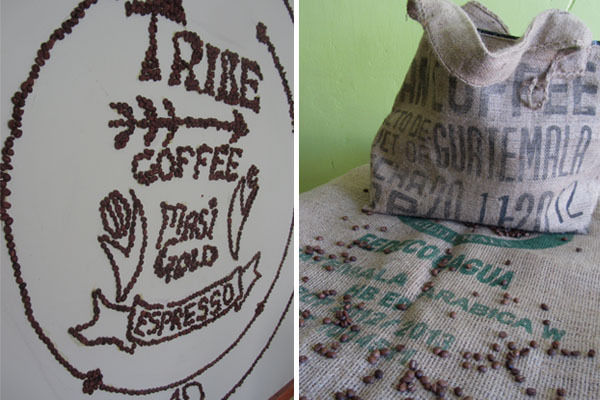 The Tribe coffee gurus trained Clement in the art of coffee – from roasting to visiting roasteries to tasting different coffees and blends. He learnt the science of coffee but more than anything he learnt to love coffee and treat it with the passion required for a fantastic cup of coffee. 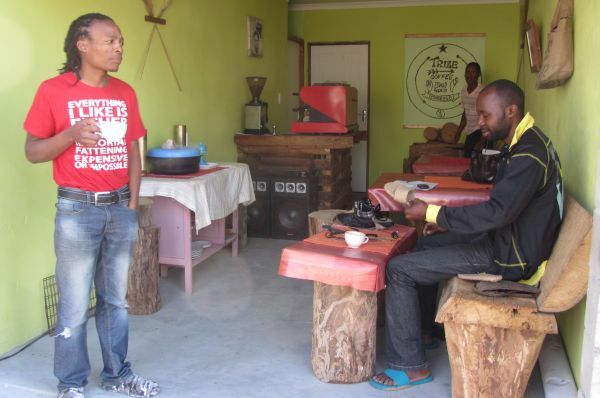 On 6 May 2013 Clement opened the doors to his own coffee shop – Masi Cafe- the realization of a dream. 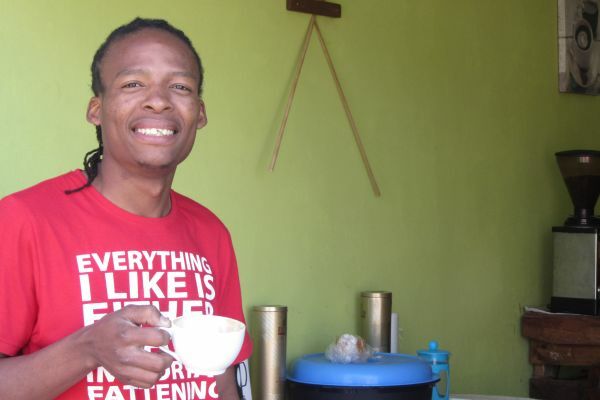 Tucked down a side street off Pokela Rd in Masiphumelele (locally called Site 5), Clement stands proudly in his red t-shirt – with a ready smile, a warm welcome and YES – a fabulous cup of coffee! Clement apologized for not being dressed in full barista gear. Next to me sat Gerald , with a steaming mug and frantically busy sewing needle. Gerald was making a pair of shoes for Clement to wear at the SCASA Coffee Championships Western Cape Cycle (towards the Nationals) 2013 to be held from 23-26 May 2013 at the Good Food and Wine Show in Cape Town. Part of Clement’s dream is skills development and to promote local arts and crafts and to display and sell unique creations. Clement believes that he can educate people about coffee and change his Masi clientele from a “ricoffy culture” to one where a fine Arabica coffee is not negotiable every morning! He believes that coffee has the ability to bring different cultures together where Nigerians, Somalians, South Africans can mix and mingle in a “ghetto” environment. He believes that coffee transforms networking and business opportunities and that coffee can break any relationship barriers. Masi Cafe is in a garage where all the materials and set-up have been sourced and created from re-usable materials and built by hand. 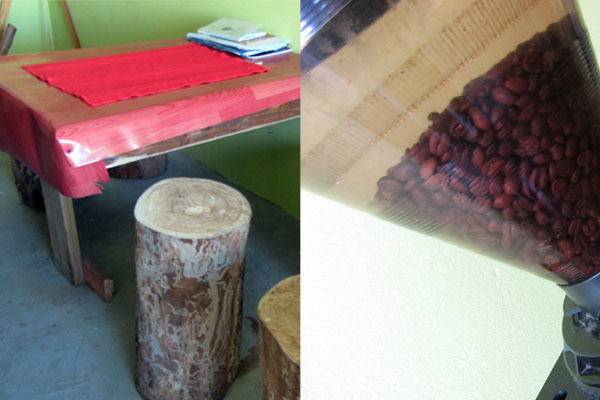 Wooden palettes have been hammered together to create the coffee station, the decor sourced locally and hand-made. He bought a 2nd hand coffee machine, has borrowed the grinder from Tribe and hand built wooden tables and chairs from a fallen tree. 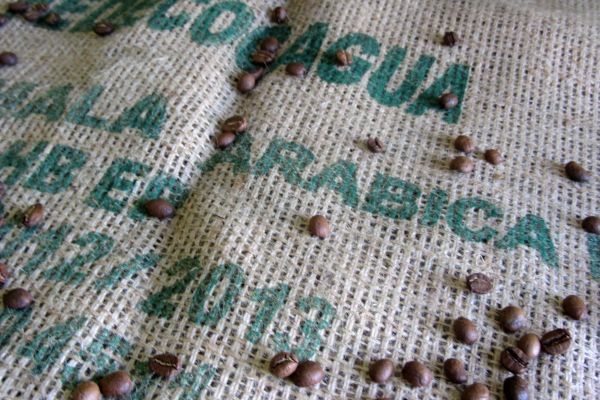 Without a doubt – coffee is the theme and all coffee is Fair Trade Certified from Tribe. 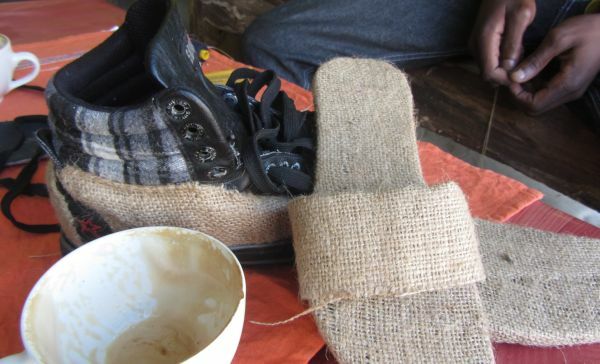 At Masi Cafe there is a “one size fits all” coffee policy. 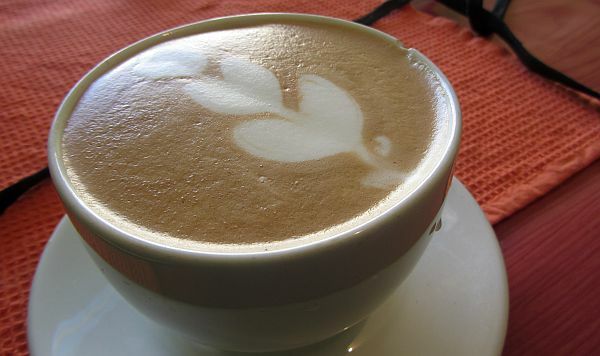 Any cappuccino, latte, or cafe Mocha costs just R10. Buy 2 Cappuccino’s and the 3rd one is free. Clement is also keeping the food local and selling traditional South African Food to complement his beverages. Samp & Beans, Vetkoek, Chicken Feet, sheeps head, braaied chicken and liver are all delicacies on the menu: All meals are R25 + include a free coffee. For just R2 you can get a igwinya (Vet Koek) with your coffee. Clement and Masi Cafe are taking GREAT coffee to the townships, they are changing perceptions, they are changing coffee culture and they are educating and developing coffee in an inspirational way. This entry was posted in Restaurants and tagged Cape Peninsula, Cape Town, Coffee on the Cape Point Route, Coffee shops, Township Coffee. Bookmark the permalink.